Classic Profiteroles with a Vanilla Filling, and a Chocolate sauce. Preheat your oven to 200C/180C Fan, and line a large tray with parchment paper. Bring the water, Sugar, Salt and Unsalted Butter to the boil in a pan over a medium heat. Remove from the heat as soon as it boils, and add in ALL of the flour in one go. Stir like crazy and beat for about 15 seconds or so till a smooth ball shape is formed and it's coming away from the edge of the pan. If it doesn't come away, cook the mixture on a low heat for a little longer and try again. Leave the mixture to cool for five minutes or so, off the heat. Beat your eggs, and then GRADUALLY beat it into the flour mixture. Beat fully and well each time you add in more egg until you reach a smooth, glossy and dropping consistency. If the mixture becomes really thin, you've added too much egg. If it curdles, you've added too much at one time, and if the mixture is too stiff, you've not added enough! Pipe little rounds onto the tray, and bake in the oven for 20 minutes roughly until crisp. I made 20 profiteroles with this batch. Once baked, remove from the oven and pierce the bottom of the profiterole immediately with a skewer and leave to rest with the hole facing upwards to let the steam escape and let the pastry cool. Add the vanilla, mascarpone and Double Cream and stir with a spoon to combine. Add in the icing sugar and stir again! Whisk up until thick. Pour the mixture into a piping bag, snip off the end, and carefully fill the profiteroles with the cream through the steam hole until full. Heat the cream in a pan over a low-medium heat. Add in the chopped chocolate and whisk till smooth. Leave to cool before using! 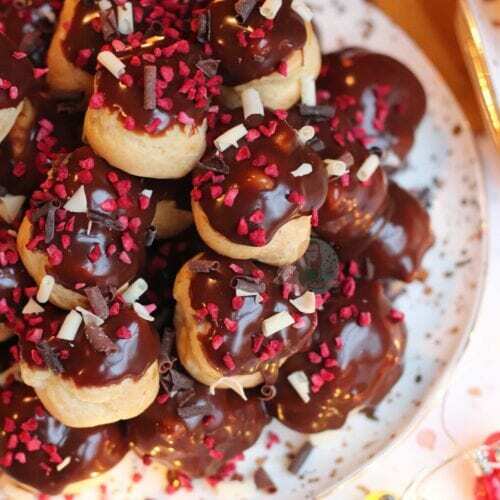 Coat the profiteroles with the sauce and then decorate how you fancy. I made a giant pile and then drizzled over some extra chocolate! I made 30 profiteroles in this batch, and that gives 4ish per person depending on how many you want to serve! You can flavour the mascarpone cream differently if you prefer such as with orange extract. These are best eaten on the day of making, but can be eaten for two days after once refrigerated.